Blondie and Brownie: YES! There's a Concrete at Citi Field! One of my only gripes about the Shake Shack at Citi Field was the lack of their own signature concrete. Every other Shake Shack has at least one! Well, it looks like things changed this season, and you still have a few chances to score the Nut-thing But Amazin'! Hopefully, the boys will win one for you too! 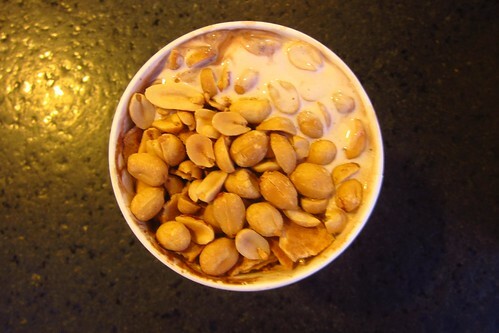 The Nut-thing But Amazin' is vanilla custard with a hot fudge swirl, peanuts, and crushed sugar cone. I loved the peanuts and crunch from the sugar cone, but I did wish the peanuts were roasted as the saltiness would play well with the sweet. That would have taken the concrete to another level and really made it a treat to be had. I was firmly disappointed with my lack of fudge swirl. It was subtly present, but I was hoping for a real, visible swirls of fudge. But I have another notch in my concrete belt, and for that I'm happy. The quest to eat them all continues!